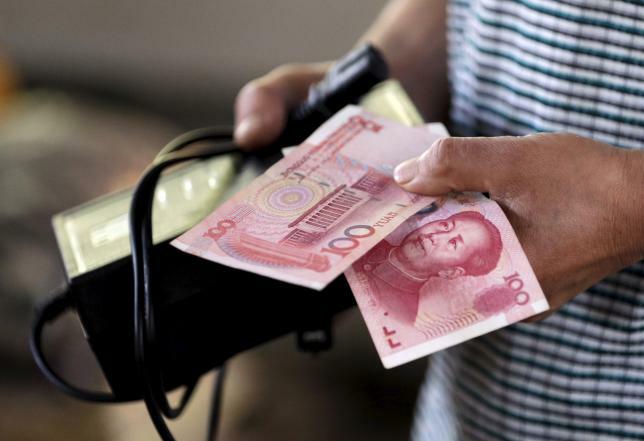 SHANGHAI – China’s yuan hit a four-year low on Wednesday, falling for a second day after authorities devalued it in a move that sparked fears of a global currency war and accusations that Beijing was giving an unfair advantage to its struggling exporters. Spot yuan fell to 6.43 per dollar, its weakest since August 2011, after the central bank set its daily midpoint reference at 6.3306, even weaker than Tuesday’s devaluation. The currency fared worse in offshore trade, touching 6.57. The central bank, which had described the devaluation as a one-off step to make the yuanCNY=CFXS more responsive to market forces, sought to reassure financial markets on Wednesday that it was not embarking on a steady depreciation. “Looking at the international and domestic economic situation, currently there is no basis for a sustained depreciation trend for the yuan,” the People’s Bank of China said in a statement. Nevertheless, a senior trader at a European bank in Shanghai said the unexpected devaluation had caused “some panic” in the markets. “Although the central bank made explanations again today, stressing the yuan would not show sustained depreciation, the market is very jittery,” he said. The yuan has now lost 3.5 percent in China in the last two days, and around 4.8 percent in global markets. Other Asian currencies were also lower on Wednesday in response, with Indonesia’s rupiah and Malaysia’s ringgit hitting 17-year lows, and the Australian and New Zealand dollars at six-year lows. Indonesia’s central bank pinned the rupiah’s fall directly on the yuan devaluation and said it would step into the foreign exchange and bond markets to guard against volatility. A trader at a Chinese commercial bank said he expected the yuan devaluation would be over once it nears the official midpoint. “Judging from past two days … the one-time devaluation engineered by the central bank could be between 4-5 percent before the currency returns to fresh stability,” he said. Tuesday’s devaluation followed a run of poor economic data and raised market suspicions that China was embarking on a longer-term slide in the exchange rate. It was the biggest one-day fall in the yuan since a massive devaluation in 1994. A cheaper yuan will help Chinese exports by making them less expensive on overseas markets. Last weekend, data showed an 8.3 percent drop in exports in July and that producer prices were well into their fourth year of deflation. China’s Ministry of Commerce acknowledged on Wednesday that the depreciation would have a stimulative effect on exports. More indicators due on Wednesday for factory output, retail sales and fixed-asset investment are expected to underline sluggish growth in the world’s second-largest economy. Data from the Finance Ministry showed a jump in fiscal expenditure of 24.1 percent in July, which reflects Beijing’s efforts to stimulate economic activity. The International Monetary Fund said China’s move to make the yuan more responsive to market forces appeared to be a welcome step and that Beijing should aim to achieve an effectively floating exchange rate within two to three years. Beijing has been lobbying the IMF to include the yuan in its basket of reserve currencies known as Special Drawing Rights, which it uses to lend to sovereign borrowers. This would mark a major step in terms of international use of the yuan. “Greater exchange rate flexibility is important for China as it strives to give market forces a decisive role in the economy and is rapidly integrating into global financial markets,” an IMF spokesperson said in an emailed statement. The devaluation was condemned by U.S. lawmakers from both parties on Tuesday as a grab for an unfair export advantage and could set the stage for testy talks when Chinese President Xi Jinping visits Washington next month given acrimony over issues ranging from cybersecurity to Beijing’s territorial ambitions. Not all countries consider the devaluation a threat, however. Korea’s Finance Minister Choi Kyung-hwan said the impact would be positive for Korean exports to China, much of which were intermediate items and not in direct competition with Chinese products. While a weaker yuan will not cure all the ills of China’s exporters, which suffer from rising labour costs, it will help relieve deflationary pressure, a far bigger concern in the view of some economists. Falling commodity prices have been blamed for producer price deflation, putting China at risk of repeating the deflationary cycle that blighted Japan for decades.